How Can China and India Boost Economic Ties? The bilateral business relationship has underperformed. Here’s what can be done. Beijing consistently amazes foreign visitors with its size, cleanness, efficiency, and youthful atmosphere (especially the buildings) that belies its long and rich history. Not surprisingly, visitors to Beijing question whether China should still be categorized as a developing nation. But Beijing is the capital and among the most advanced cities in China, and certainly does not represent the national norm. According to 2014 data, Beijing’s GDP per capita (nominal) stands at more than $16,000, more than double the national average of just $7480. There are significant wealth disparities among China’s regions. In fact, most of the coastal provinces and Inner Mongolia (with a combined population of 413 million) have reached GDP per capita (nominal) in excess of $10,000, whereas the rest of China, especially Western provinces such as Gansu, Guizhou and Qinghai, still have GDP per capita as low as $4,297. Given that global GDP per capita is more than $10,000, China is still a developing country. It is a developing country keep to build ties with Asia’s other awakening economic giant, India. During interactions with the academic and diplomatic communities as part of the Russia, India and China (RIC) conference earlier this year, I had the clear impression that China wants to positively engage with India in a number of areas. 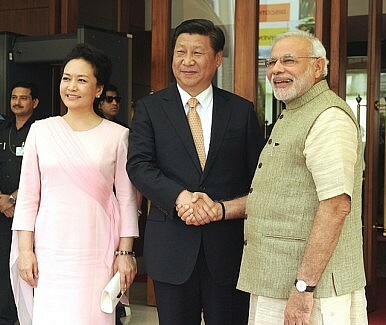 The Chinese also appeared keen to see India assume a leadership role, along with China, on the global stage. Without a doubt, engaging with China, especially in the economic sphere, is important to India. India’s trade with China was miniscule until the 1990s, but has been growing at terrific pace since the 2000s. Trade (exports plus imports) with China as a proportion of India’s trade with all countries was only 0.2 percent in 1991-92 and 2.1 percent in 1999-00, but rose to 6.5 percent in 2004-05 and 8.7 percent in 2013-14. Since 2008-09, China has surpassed the U.S. as India’s largest trading partner (among individual countries). However, there are several imbalances in India-China trade relations that should be of concern to policymakers in New Delhi. First, China-India trade is far more important to India than it is for China. For China, trade with India was only 1.6 percent of its total global trade in 2013, according to the China Statistical Year Book 2014, much lower than the 8.7 percent we noted for India. Of course, India is hardly alone. China’s largest trading partner is the EU, which is not among the 120 countries that have China as their largest trade partner. That means that for all 120, trade with China is more significant to them than it is to China. The difference should also be placed in the context of GDP – China’s economy is nearly five times the size of India’s ($9.2 trillion to $1.8 trillion, according to the World Bank). Closing the GDP gap would make the weighting of China-India trade the same for both countries, and would give India a foreign trade dependence that some observers see as healthier for national security. Moreover, as total foreign trade surges, China-India trade can account for a diminishing proportion of India’s total foreign trade – as has been evident in China-U.S. trade. The second imbalance of concern is that India has a large and growing trade deficit with China. In 2013-14, India’s imports from China were valued at $510 billion, whereas its exports to China amounted to only $150 billion, meaning imports were 3.4 times exports. In fact, India’s trade deficit with China accounted for more than a quarter (26.2 percent) of the country’s total trade deficit in 2013-14. Traditionally, trade imbalances play a negative role in bilateral relations. This can be seen in the China-India relationship, in the form of trade disputes and particularly anti-dumping investigations. India and China should thus seek ways to balance their trade, recognizing that balanced trade is crucial. The most effective way to do this would be increase India’s exports to China, making full use of its comparative advantage. As is well known, India has one of the world’s best service sectors, which provides crucial support for leading advanced economies such as the U.S. and Japan. China, meanwhile, is a manufacturing powerhouse, but has been relatively slow to develop its service industry. Today, China is trying to shift from labor-intensive to knowledge-intensive manufacturing, and will require support from high-level service providers. This suggests that promoting the export of Indian services to China, including education, tourism, IT, and manufacturing services, is one feasible approach to correcting trade imbalances. Another advantage India enjoys is its abundant labor. China and India in fact have similar populations, but India has a much larger potential labor force. The element most frequently cited in the economic growth of China and Asian tigers is their large pools of labor and complete industry chains, from labor-intensive to knowledge-intensive sectors. India’s population growth rate has declined significantly over the past decade, which means that it will eventually face the same aging trend seen in the EU, Japan, and to a lesser extent China. When that happens, India will lose its so-called demographic dividend. Before then, India must try to harness its labor force. If it fails to do that, India will face the danger of getting old before it gets rich – the same challenge that confronts China today. India’s economic success has come mainly from its services, especially software engineering. That makes India’s development path entirely different from that of other developing countries, particularly the East Asian economies. India’s development could well benefit by tapping its abundant labor, because, in comparison with East Asian development paths, which saw the economies go up the industry chain from the lowest end, India has the opportunity to complete the chain from two ends (labor-intensive manufacturing and high-end services). The nature of India-China trade may be another cause for concern. India’s imports from China consist largely of advanced manufactured products. (Machinery including boilers and mechanical appliances accounted for 46.4 percent of all Indian imports from China.) On the other hand, India’s exports to China consist largely of raw material such as cotton and iron ore. This reflects the comparative advantage and competitiveness of the two countries. China has embraced the market economy with Chinese characteristics for more than 30 years. And like India, at the beginning of reform and opening up, China’s foreign trade mainly depended on raw materials like coal, timber, and handicrafts, with manufactured goods accounting for less than 50 percent of China’ exports in 1980. But as the huge amount of labor hidden in agriculture was transferred to industrial sectors, labor costs for manufacturers plummeted, competitiveness surged, and China began exporting more and more low-tech, labor-intensive products like umbrellas, shoes, toys, and clothing. This process brought with it several benefits, such as enlarging China’s own market with the higher salaries, improving the skills of migrant workers, and refining production technologies and management of enterprises that benefited from foreign direct investment (FDI). All of this in turn drove further economic growth. However, the most striking impetus for the competitiveness of Chinese manufacturing was its accession to the WTO. That drove reform and opened the rest of these Chinese market to foreign capital. Meanwhile, zombie companies gradually folded while healthy companies grew stronger. Without the numerous market-driven enterprises and the active use of all available resources – labor, land, energy, foreign investment, and technologies – it is inconceivable that China would have achieved the competitiveness to move on to advanced manufacturing and even to export machinery to economic giants. Therefore, to balanced China-India trade, in the short run, the two countries could bolster cooperation based on their respective advantages, such as promoting Indian service exports to China. In the long run, the two countries may have to seek a broader division of labor, with reference to the so-called flying geese model. It should be noted, though, that this model would have two leaders: Some regions of India would lead in high-level services, some regions of China would lead in high-level manufacturing, and the remaining regions of India and China would line up after the leaders. Indian Prime Minister Narendra Modi’s Make in India campaign needs Chinese capital as well as Chinese expertise in infrastructure building. However, current levels of Chinese investment in India are modest. Between 2013 and 2015, India received only $619 million in foreign direct investment (FDI) from China, representing just 1.1 percent of the total FDI that India received from all countries during this period (around $55 billion). One reason for this is that China is a latecomer in providing FDI. Until 2013, Chinese investment stock accounted for only 2.5 percent of the world total. In 2012, the investment flow represented just 6.5 percent of the world total. Second, 72.6 percent of China’s FDI in 2013 flowed to seven economies: Hong Kong, ASEAN, the EU, Australia, U.S.A, Russia and Japan. Compared with other developing countries, then, the investment flow India received from China is not inconsequential. Still, Chinese investor preferences for more advanced economies suggest that they find a strong and market-oriented legal system, clean government, and predictable policies more appealing than opportunities represented by developing countries, such as inexpensive labor. Perhaps infrastructure investment offers a way forward. China is justifiably renowned for its remarkable achievements in infrastructure construction, which has benefited from the support of China governments of all levels. Interest subsidies, tax breaks, facilitation of land acquisition, conducive regional development planning, and the most important stimulus of all, the prospect of economic growth, have all lent impetus to infrastructure building. China has now passed its peak period of infrastructure creation, yet that high-quality capacity is still available for other developing countries. Chinese enterprises have long wanted to invest in India; however national security concerns have always deterred them. As elsewhere, business in China is driven by the profit motive, but in India they must overcome constraints like strict labor and land acquisition laws, government interference, and incomplete supply chains. Dr. Lianlei BAI is an assistant research fellow at the China Institute of International Studies. He has a Ph.D. in economics and a Master’s degree in international politics from CASS. His research interests include China’s geo-economic policies and their political impacts.